With a peaceful environment at the gates of Deauville and Trouville-sur-Mer, this 3-star hotel is less than 3 km from the beach and its legendary landscape. The property, with modern and comfortable rooms, has a restaurant, private parking, a coffee lounge and meeting room. Whether staying in Deauville for work or leisure, the hotel offers 58 rooms with all the necessary commodities for a relaxing stay. Air-conditioned and equipped with large double beds or twin beds, they have free Wi-Fi, flat screen TVs with satellite channels and coffeemakers. Our family rooms can accommodate up to 4 people. Located in the peaceful garden, the restaurant offers a contemporary and friendly atmosphere. We offer seasonal cuisine, daily specials, unlimited buffet formulas and a varied menu. The friendly and attentive staff are at your service to meet your expectations. Half-board service is fairly priced. 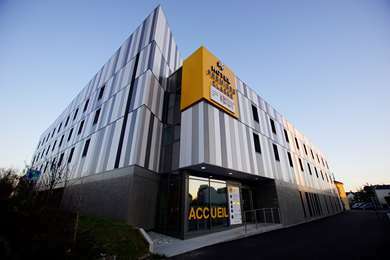 For seminars and workshops in Deauville, we offer a meeting room with Wi-Fi access for up to 40 participants. It offers a lovely view of the garden and has 2 flipcharts, a screen, a video projector and a network socket. Home to the American Film Festival, Deauville has many other attractions. 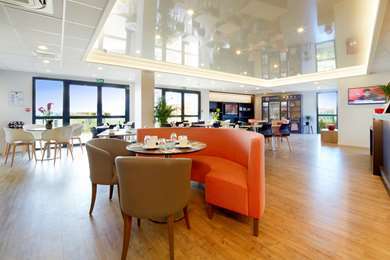 The hotel, less than 2 hours from Paris on the A13, is located near several golf courses, 2 casinos, a thalassotherapy centre, and the Deauville La Touques racecourse. 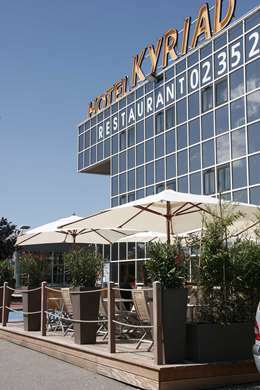 Your 3 star Campanile hotel-restaurant in Deauville has 58 comfortable rooms. Choose from 27 doubles, 17 twins, 7 triples and 7 family rooms, which sleep up to 4 guests, whether you are on a business trip or family holiday. Our hotel is accessible for guests with reduced mobility and has three accessible rooms. All rooms are well-equipped and feature a bathroom with bath, large desk, reversible air-conditioning, hair-dryer, LCD television and free Wi-Fi. You will find a welcome tray with a kettle, tea, coffee and cakes in your room. From 6:30 a.m. to 09:30 a.m. during the week and from 7:00 a.m. to 10:00 a.m. at the week-end, enjoy a balanced buffet breakfast: tea, coffee, fresh fruit juice, cereal, pastry, eggs, breakfast meat, yogurt and fruit salad. From all directions: follow signs to Deauville hippodrome.